Calafia Beach Pundit: Can optimism make America great again? It sure can't hurt. 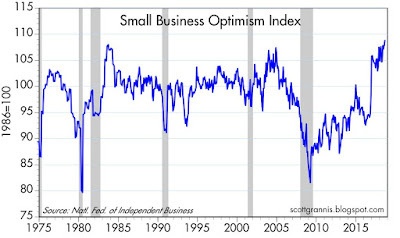 Thanks to sharply reduced tax and regulatory burdens, small business owners are more optimistic about the future than ever before. If we can make it through the current tariff wars, the US economy could experience surprisingly strong growth in the years to come. 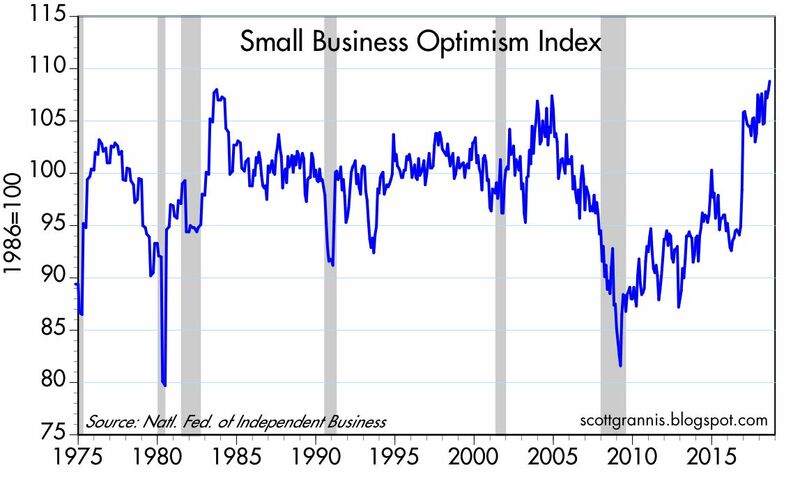 Chart #1 shows how dramatically small business optimism rose in the wake of Trump's election. The index shown stood at 94.9 as of September '16. It now stands at a record-high level of 108.8. Trump gets pretty much all the credit for this, in my book. 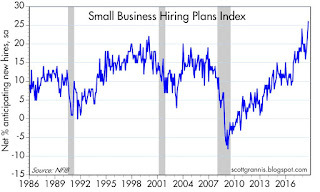 Small businesses account for the great majority of jobs in the US. 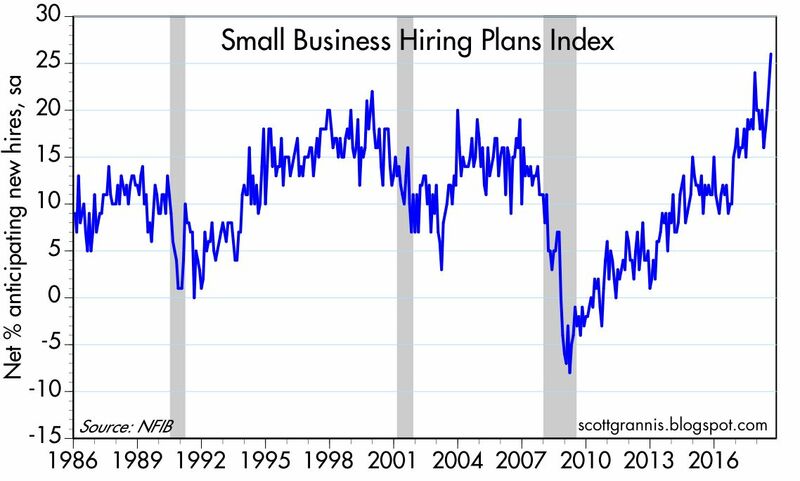 An index of the hiring plans of small business owners, shown in Chart #2, stood at 10 just before the November '16 elections. That has subsequently soared to a record-high 26 as of last month. 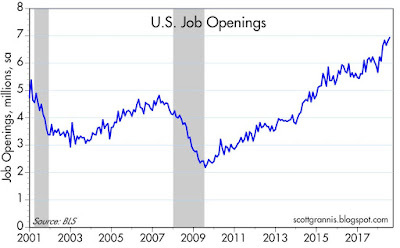 New job creation is almost sure to increase as a result. 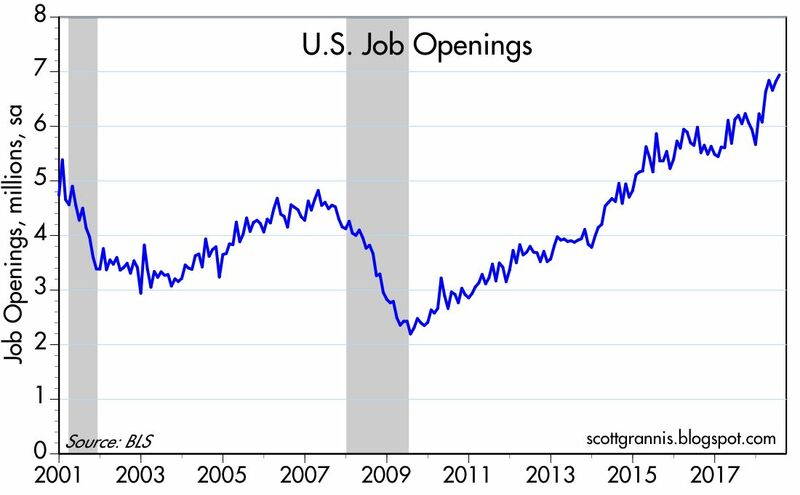 Not surprisingly, job openings already have increased by over 24% since October '16. I see no reason why this can't continue. 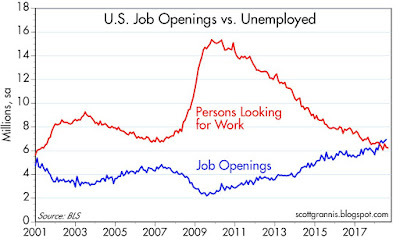 Since job openings now clearly exceed the number of people looking for a job (Chart #4), it is reasonable to think that companies that want and need more workers will inevitably have to entice more workers (that are currently on the sidelines, and which could conceivably total 8-9 million) to enter the workforce via better wages/salaries. What's not to like? All those new companies and expanding companies need more workers because they have, thanks to Trump, become more efficient and more productive. That alone justifies higher wages and salaries. If Trump can turn his tariff wars (which I and others have argued are essentially negotiating tactics in the pursuit of more and freer trade) into tariff truces, then the future could hold very surprising and promising growth prospects. As I've said before, it makes little sense to bet against what could prove to be a win-win for all parties (i.e., if the threat of higher tariffs results in concessions that lead to lower tariffs, then all parties to international trade can win). Under this positive economic scenario, what is the risk that wage inflation spoils the stockmarket party via pressure on profit margins and/or a more agressive Fed? Inflation starts and stops with the Fed, it doesn't come from wages. What you're really asking is what happens if inflation starts to be a problem. Well, that's been the story of every recession for the past 50 years. The Fed needs to raise short-term rates, and they do so until the economy starts to stumble. In other words, unwanted inflation seems inevitably to lead to a recession, and it's all the Fed's fault. Has the Fed made a mistake? So far I don't think so, so I'm not particularly worried about a Fed-induced recession. I have followed you for years, Thank You! Do you think we would be better off without the Federal Reserve making rate decisions or better off with letting the free market decide rates? you are all such clowns. there is no wealth effect. with inflated returns from lowering the discount rate on all assets comes the same thing on future consumption obligations. money is an illusion. Larry, re the Fed or the market setting rates: It's difficult to accept the proposition that the members of the FOMC are wiser and more capable of setting rates than the market. The Fed has made plenty of mistakes in the past, and that should be enough to conclude that having the FOMC decide rates is a bad idea. Although having an FOMC set rates is definitely sub-optimal, I would argue that, increasingly, the Fed has been paying more attention to the market's signals. I've talked about this in prior posts. The Fed and the market are in effect in a complex dance, where one leads the other and vice versa. I'm pretty sure the current Fed is not leading the market, but rather is listening intently to what the market has to say. The Fed floats a plan, the market digests it, and then reacts favorably or unfavorably. If the market were in disagreement with the way the Fed is leaning, I think they would pay attention. I have always been quick to suspect the Fed of making mistakes in the past, and at times I've been right. One instance comes to mind when towards the end of 2000 I thought the Fed had delayed easing way too long. I think they exacerbated the deflationary pressures that were evident at the time by keeping rates too high for too long. I took a long position in Fed funds futures, and I was rewarded in late January when they eased by much more than the market expected. Payaso: The one-time reduction in corporate income taxes that has increased equity valuations and wealth is not necessarily going to stimulate the economy, as you suggest. What makes a big difference, however, is that the after-tax rate of return on risk taking today and in the future has increased significantly. This will stimulate more risk-taking, more investment, and more productivity, and all of that in turn should cause the economy to grow at a faster-than-otherwise pace for the foreseeable future. I am an outlier on Trump tariffs. Industrial location today has very little to do with the old-fashioned concept of comparative advantage and instead is primarily the result of government manipulation. What is, is. I think America should fight for every job we can get and maintain a vigorous industrial base. "What is, is. I think America should fight for every job we can get and maintain a vigorous industrial base." And SCREW the American consumer in the process-because after all, they cannot possibly be informed buyers. Rather, we should FORCE American consumers to BUY AMERICAN! Who cares if it's more expensive than goods purchased elsewhere. Who cares if it pushes up inflation unnecessarily and who cares if it smacks of progressive cronyism! If you want to consume, you gotta produce. I have always been suspicious that the United States can import and borrow its way to prosperity. The free traders seem to think borrowed money is the same thing as earned income. Obviously there are a lot of issues of development economics too lengthy discuss in a comments section. As I say, I am reserving judgment on Trump tariffs. Keep this in mind: the multinationals, by their own statements, claim to have nearly irreplaceable supply chains in mainland China. Guess what sort of PR campaigns we can expect from multinationals. They finance media, think tanks, academia and powerful lobbies. "In light of the U.S. turning its back on free trade, what should China do? Ideally, ignore the U.S. and open up further, as it will likely do and as we are seeing with the equity and bond markets. It should embrace free trade across the Asian region and with the EU. It should be the global trading partner with the world that the U.S. once was but no longer desires to be. The “One Belt, One Road” initiative is opening up new countries to trade and infrastructure. Freight trains from China, through Central Asia and on to Europe complement the established sea routes through Southeast Asia and East Africa, and the air routes both east and west. China is putting itself at the center of global trade; historically, the country in this position has enjoyed economic, social, and artistic progress, no matter the century, nor the religion." Lotta wailing and gnashing of teeth in the comments sections of economics blogs in the face of good news. Meanwhile, regular Americans are making hay while the sun is shining. Small biz is happy and excited about the future. Socialists/Democrats never quit, so the sunny growth days wont last forever. Its hard NOT to be optimistic. Rule of Law is being restored in government. America's portfolios are at all time highs. GDP, wages, and optimism all at highs, while unemployment for America's most marginalized citizens is at all time lows. 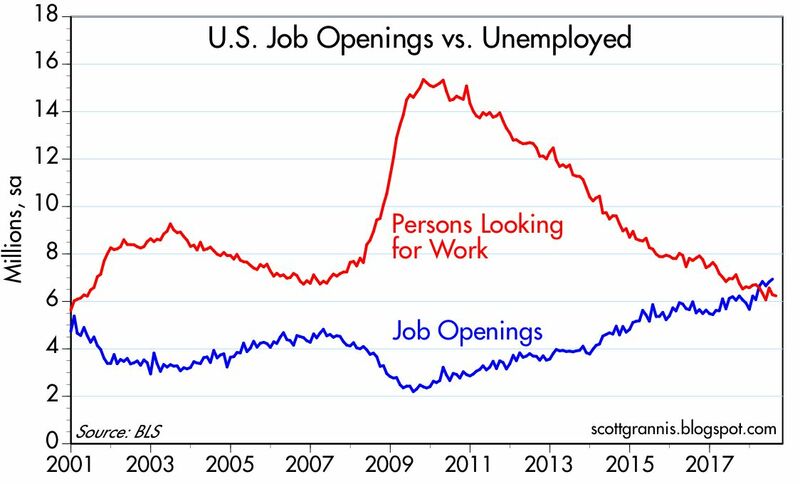 Minority and Youth unemployment plus unemployment for those without high school diplomas are ALL at record lows. "Trump" still has a huge put to call ratio in the face of massive prosperity for ALL. Unintended consequences. All part of MAGA. Frankly, I am liking Donald Trump's policies more and more. I wish him well in his objectives. I am hoping his tariffs will pay dividends with better trade agreements, especially with China. Here's my worry. Consumers, businesses and investors are always the most optimistic just before a stock market crash, and there seemingly is no sign markets are about to turn negative. That's when it happens---suddenly and swiftly. There's lots of optimism among investors these day, and that's not necessarily good. Wall Street climbs a wall of worry! No wall of worry, no Wall Street climbing. I've got about 30% in cash in my investments, awaiting some meaningful pullback, which I expect. I don't think we'll have a recession and bear market, however, until the Federal Reserve kills the party. Thankfully, the economy is in great shape (one exception is national debt) and can be expect to continue its growth. Yes, there's much to cheer, but we are constantly in danger of turning around. Great job, Scott. Trade issues still worry me. I'll be glad when they are behind us. When they are, look for this stock market to boooooooom! Well, I am something of a worry wart. The Federal Reserve projects that given its plan to raise interest rates, it will reach an inverted yield curve sometime next year. That is what the central bank is projecting. The GDPNow model estimate for real GDP growth (seasonally adjusted annual rate) in the third quarter of 2018 is 4.4 percent on September 19. Core consumer prices were up 2.2% over the past year ending in August. Year-over-year August rates have been increasing for CPI: 2018 @ 2.7%, 2017 1.9%, 2016 1.1%, 2015 0.2%. Does this mean rates will be much higher in 2019 and no longer tolerable for the Fed, and that what Benj points out will have become a reality: an inverted yield curve? What follows: another recession? This will not be good news for President Trump's try at a second term. Not good news for the stock market. Not good news for workers, consumers or investors. Optimism peaks a few weeks to a few months before a recession starts. apparently not believing in recessions. Off topic for this thread, but would be interested in your view on a potential world-wide dollar shortage vis-a-vis emerging market debt potential difficulties being caused by dollar denominated debt, a strong dollar and rising US interest rates. Cliff Claven of Finance, I don't think any of this blog's readers take you seriously because you're constantly trashing Scott's views. Try being more constructive in your comments and you might attract some of us to give you thoughtful consideration. There's nothing wrong with being optimistic at this time. That's the current trend, not just the mind of Scott Grannis. Scott does not argue that he is always right. He admits his mistakes. He makes annual projections and points out when his fall short. His is a serious blog about economics and deserves to be given serious consideration. Change your attitude away from constant berating and your comments will be taken seriously too, as if you are seeking to add intelligence and insight to the presentation. I have to agree with above comments re optimistic Vs pessimistic. Not to say there's not such a thing as head in the sand but always looking for something negative is a great way to stay poor. This blog has existed since 2008. The author has been bullish the whole time. Even just before the huge late 2008/early 2009 crash. Those are facts you should know, not insults. You should not expect to read anything but optimism here. I don't care if you take me seriously. The stock market doesn't ALWAYS go up. those are dangerous words for investors! once or twice a decade, so it is the safe position. or a bear market, at least not to the public. for subscribers only, since 1977.
the huge late 2008 / early 2009 crash). be bullish before the next crash. then feel free to insult me. All I can say is that I call it as I see it, and I still think it pays to be optimistic. If you want to find reasons to be pessimistic, do check out Zero Hedge (https://www.zerohedge.com), whose raison d'être is being bearish all the time no matter what. I read ZH every day for that matter. just not 100% of the time. your website as a "counterbalance". that will be right 8 or 9 years out of 10.
which has been a hobby since 1977. I don't allow any comments ! and they never end well ! Is that your daughter in the picture with you? Okay, Mr. Cliff Haven of Finance, I did not insult you in my comment, but I am going to now. You deserve it. You're a blowhard who attempts to highjack someone else's blog, effort and work with your pompous claims to superiority, and your insinuations that anyone who trusts Scott Grannis is a simpleton. For your information, Mr. know-it-all, I do my own thinking and I am not optimistic all the time. You seem to fail to make a distinction between the economy and a recession and financial markets. For your information, I too turned bullish but on March 6, 2009, and I heavily invested. So you can put that in your arrogant pipe and choke on it. I see you had to insult me twice in a row ! Mr. Grannis had this blog since 2008.
financial crash since the 1930s. He has been bullish since then. It appears he is always bullish. is not bullish 100% of the time are puzzling. If you are bullish, just ignore what I write. would be the next president. I am far from a perma-bear. in this blog, please tell me where I was wrong. or they make other readers angry. serious detailed comments that no one has to read. Apparently you just can't ignore my comments? Just don't read them, and you'll feel better ! I appreciate the depth of knowledge from which you share your opinions. I was first introduced to your blog by a representative of Western Asset. As a practicing financial advisor, I find a few sources with the intellectual pedigree that you possess which makes me comfortable enough to share with clients. May I have your permission to share links to your blog with clients?